Hey Everybody! WaitThisIsntMTG back again with some tips for improving play. 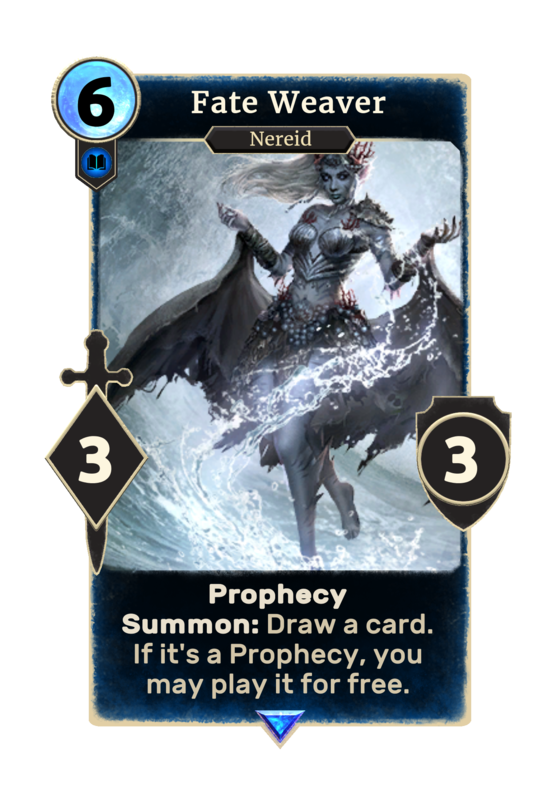 Last time we discussed lanes, today we’re going to discuss Runes and Prophecies, which are the other major defining characteristic of The Elder Scrolls: Legends (TESL). To cover the basics, every player starts the game with 30 health, and 5 unbroken runes. Every 5 health you lose, one of your runes breaks. 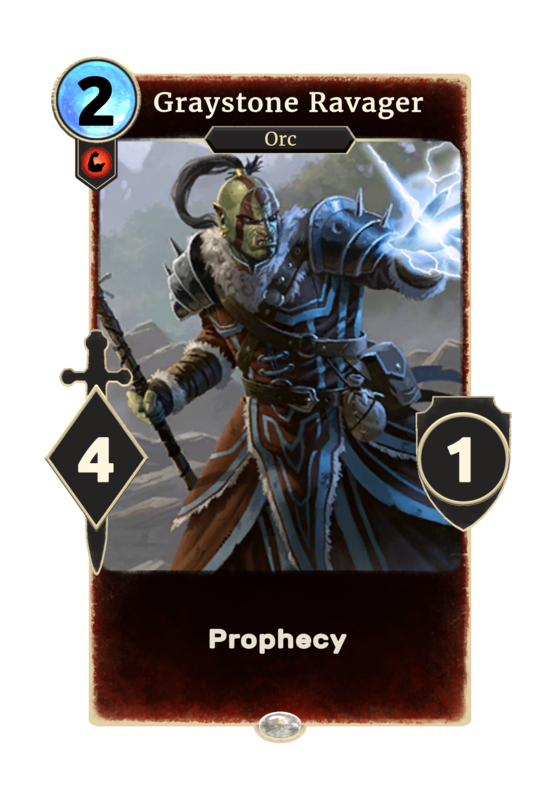 Whenever a rune is broken you draw a card, and if that card has prophecy, you may play it for free, whether it’s your turn or your opponents turn! For more details, check out Team Rankstar’s New Player Guide. An important thing to think about when deciding to break an opponent’s runes is your role in the matchup. This is something I touched on briefly last article, and I will again here as it is very important. If you believe your opponent will outvalue you late in the game, you have to play the aggressive role, which means taking the initiative on the board and being more willing to break their runes. If you think your opponent won’t be able to outvalue you late game, you will assume the control role, which in this context means not breaking runes until you have board control and can kill in 1 or 2 turns. It’s impossible to always play around every prophecy, but there are several things you can do to minimize the impact a prophecy will have. Please note that there are situations where you don’t want to necessarily follow all of these rules! These are meant to be general guidelines. If you feel you have a line of play that doesn’t follow one of these rules but is best for the situation, then go for it! Draw cards, because it may impact the way you attack and play other cards that turn. Play any tricks to help your creatures trade more effectively/boost damage. Things like: Wardcrafter; Cloudrest Illusionist; Orc Clan Captain; etc. Attack your opponent’s creatures so you can make trades without a prophecy getting in the way. Always be wary of your creatures with breakthrough, they can end up breaking runes unexpectedly (I can’t even tell you how many times I’ve done this) so make sure you trade first. Attack your opponent and break runes. Play any other cards you want to. Keep in mind the prophecies your opponent could play and seek to minimize their effects. 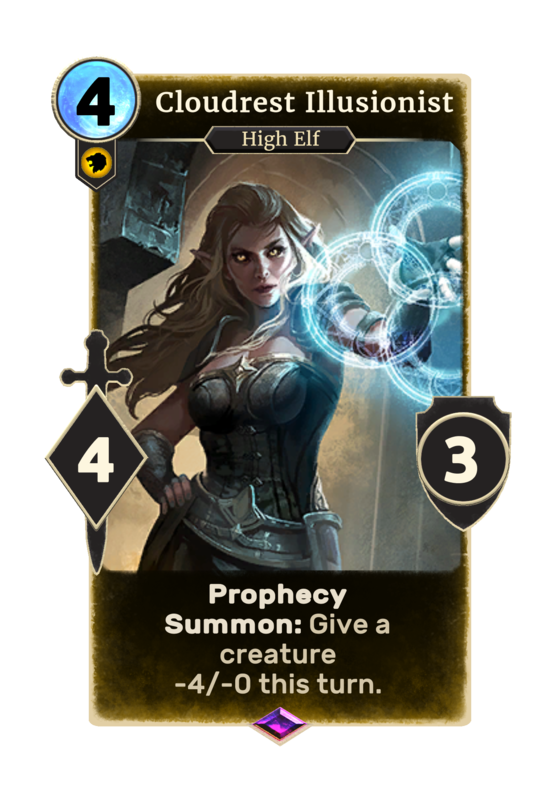 There will be a list of the most common prophecies of each color later in the article. Skip Runes – if you have a creature with 6+ power while your opponent has only 6 life left, you can attack them, killing them before they will get the opportunity to have a prophecy. You can also do this at 11, 16, 21, and 26 health, but having a creature large enough to do that is less common. You should try to line up your opponent’s health such that you have the ability to do this. For example, let’s say your opponent is at 12 life and you have 3 creatures, a 5 power creature, a 7 power creature, and a 4 power creature. You want to break the 10 life rune with the 5 power creature, and then kill them with your 7 power creature, avoiding the final rune. This order also means if your opponent gets a prophecy to stop you on the ten life rune, they will not also get the additional card from the 5 life rune breaking. Attack with creatures that won’t break runes first when you are trying to push damage. For example, your opponent has 30 health and you have 4 creatures able to attack: 2 of them have 2 attack, 1 has 4 attack, and the last one has 5 attack. Excluding any other effects, you should attack with the 5 power creature, then the 4 power creature, then both the 2 power creatures. 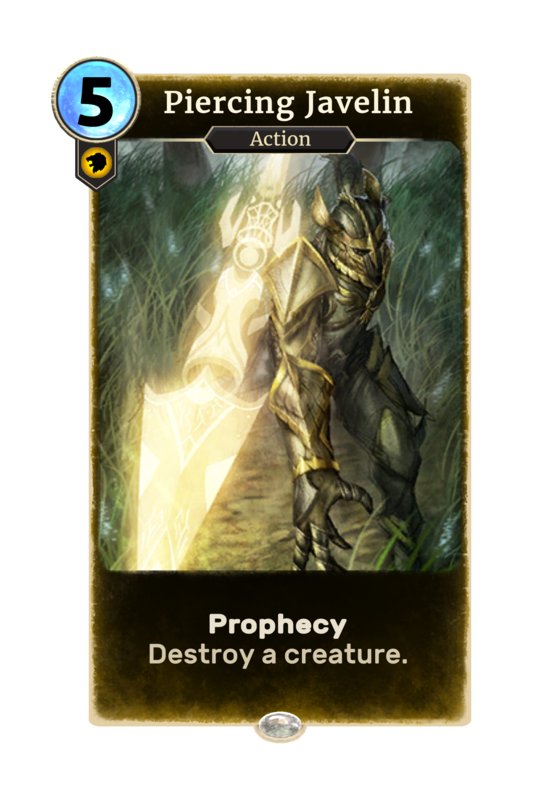 This way, if your opponent gets a prophecy like cast out, piercing javelin, or lightning bolt on their first rune, they will only have your small targets to hit that will stop an attack and will have to choose between using their prophecy on your best creature (the 5 power) or one which can still attack. Similar to #1, you want to have attacked with your most important creatures prior to breaking any runes, as to incentivize your opponent to use any prophecies on your less valuable creatures. 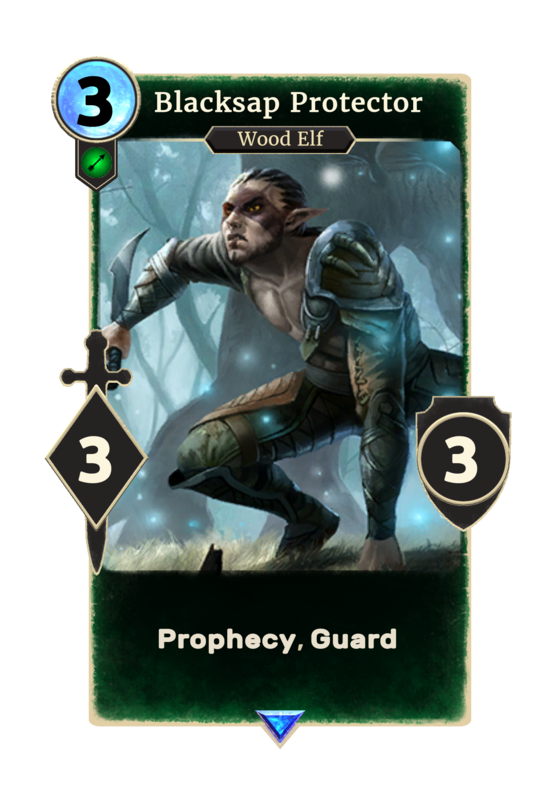 This means creatures like goblin skulk, withered hand cultist, ulfric’s housecarl, and others that you may lean on to get more cards or help keep a strong board presence, should attack before you break runes. DON’T BREAK RUNES until you have board control. This is the most important thing as a control player. It is vital that you maximize your ability to gain card advantage over your more aggressive opponent as this will be extremely helpful in swinging the game back in your favor in the later part of the game when your opponent has slowed down. 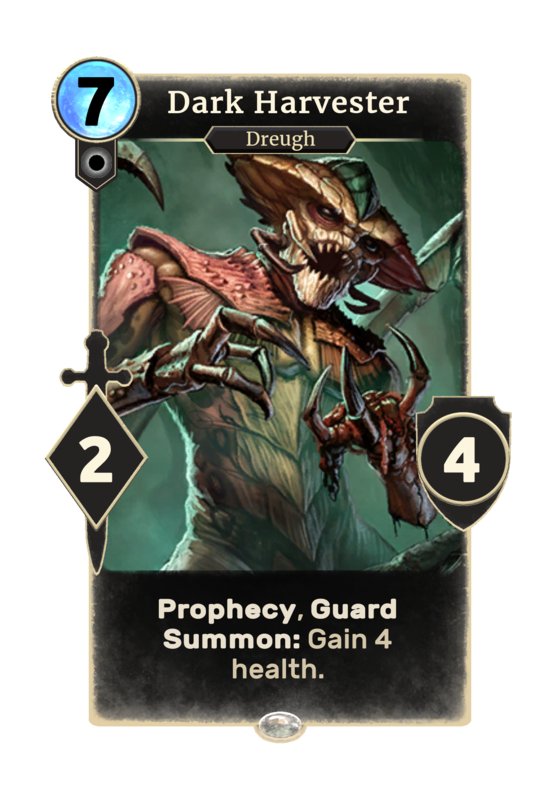 If you break a rune, even if they don’t get a prophecy them drawing a card means more things for them to play the following turn. It may seem promising to try to outrace your opponent, but don’t go for this unless you are very confident it will work. Once you have board control, you want to build up your board such that you will be able to kill your opponent in one or two turns. If you are at a very low life total, try to gain some life before you start breaking their runes, that way if they stop your kill attempt or pull a prophecy like lightning bolt they won’t be able to kill you the turn after. If you don’t have enough damage to kill them in one turn, try to minimize how much you do on the first turn to avoid them being able to make a comeback. As the aggressor: You want to use your prophecies to help strengthen your board or protect your most valuable threats. A creature with guard should be used to protect other creatures your opponent may try to trade with. 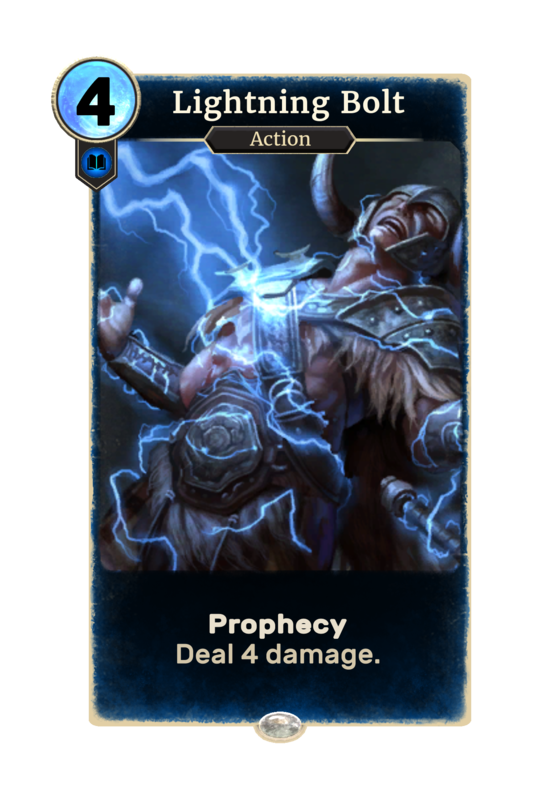 You may not always want to use a prophecy, like if you pull a lightning bolt off a prophecy early in the game that won’t help you finish your opponent or kill a valuable creature. As the control: You want to use your prophecies to slow your opponent as effectively as possible. This means trying to use guards that can remove their threats, not just stop them for a single attack, and using effects like Shrieking Harpy or Piercing Javelin to stop their largest threats. You will sometimes face a situation where you will have to choose between killing their best threat that cannot attack or another creature that can. In general, if you have a lot of life still, you should kill the more valuable threat that cannot attack. If you are low on life, you should kill the one that can still attack if it can put you too close to death. The exact specifics of what you should do depends on what you are using in your deck and should be considered case-by-case. Circle Initiate – Look out for this card in any red aggressive list and many red midrange lists. It can’t stop things on your turn, but it can put a pretty impressive 4/3 threat on their side if they can break one of your runes. 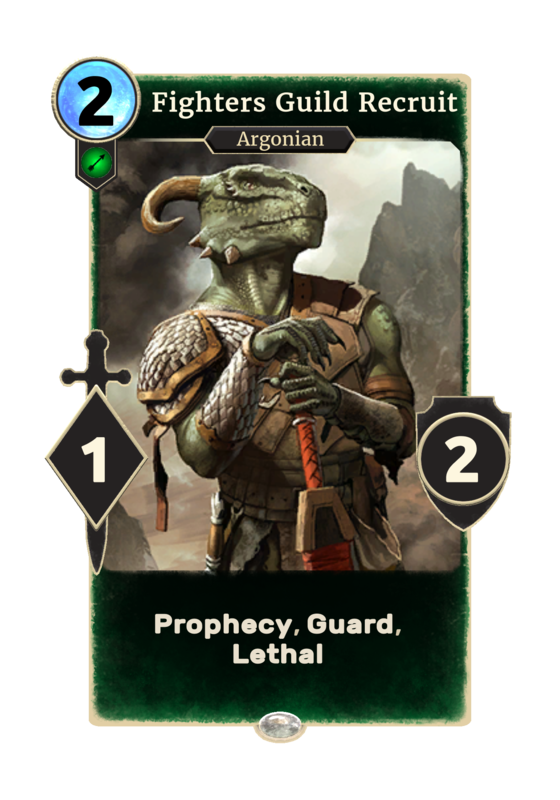 Graystone Ravager – This will generally only be in very aggressive lists, as the stats make for very poor trades and can be killed very easily. Often used in prophecy Battlemage or orc decks. Protector of the Innocent – A solid two-drop, it can slow you down because of its guard, but its 2 health makes it very vulnerable to removal or cheap creature trading with it. Morkul Gatekeeper- Again look out for this in red aggressive and midrange lists. Its guard can get in the way of your attacks and its effect can be used to boost either one of their other creatures to push damage or itself to enable a trade. 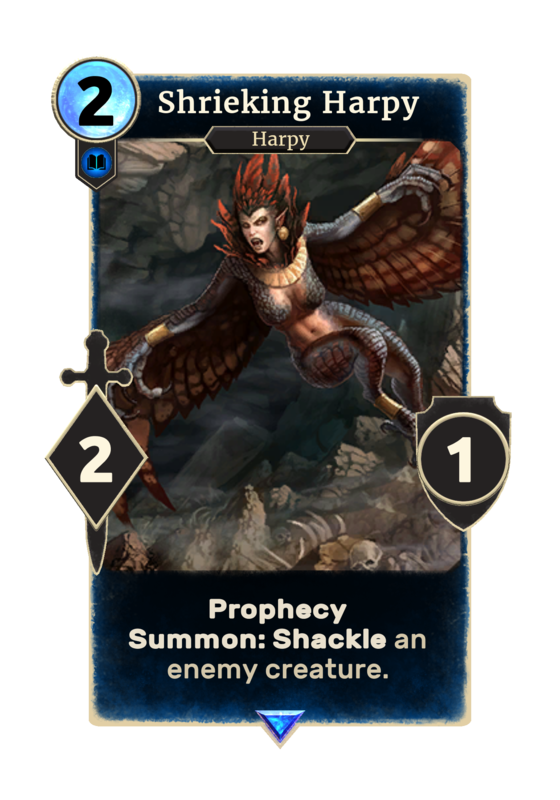 Shrieking Harpy – Played in most Intelligence decks, especially midrange and control decks, this can stop a lethal attack in its tracks by shackling the most powerful creature. 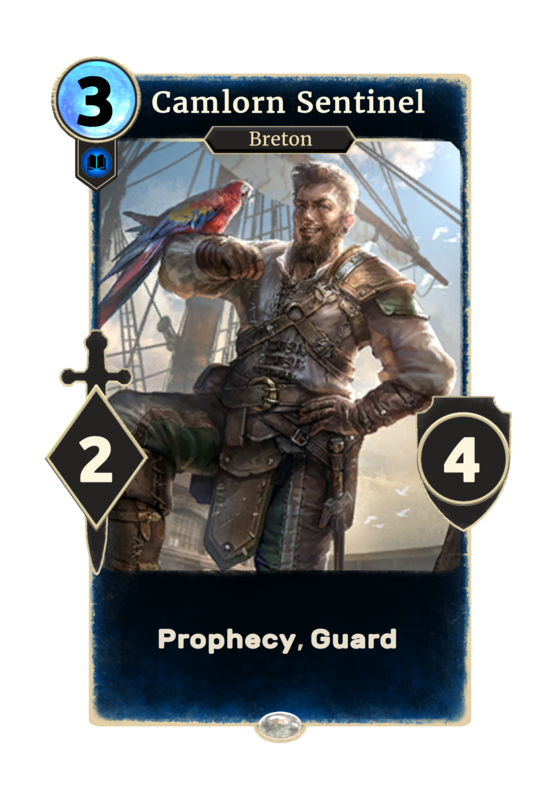 Camlorn Sentinel – Pretty much only played in prophecy-focused decks like prophecy Battlemage, as its low power makes it ineffective for trading with many minions, but it can be helpful for slowing an aggressive opponent. Lightning Bolt – Played in 99% of Intelligence decks, this is one of the most defining cards in the game. 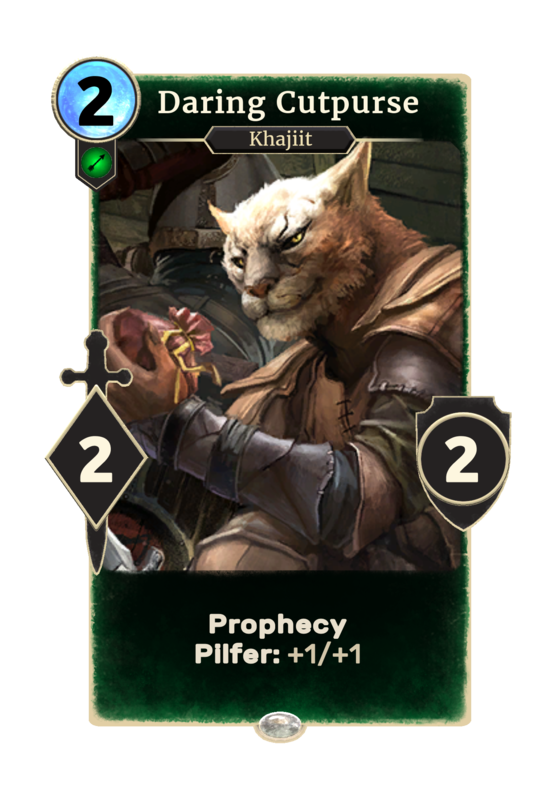 It can be used as removal for an opposing creature, or to kill your opponent, so always be wary of breaking runes when at 4 or less health. 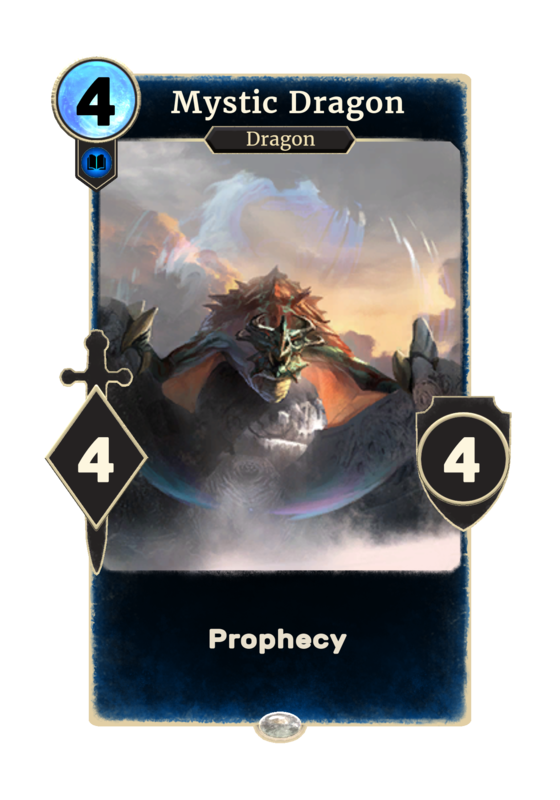 Mystic Dragon – Most common in blue midrange lists, this card can be game breaking if prophesied out early or when things are close. 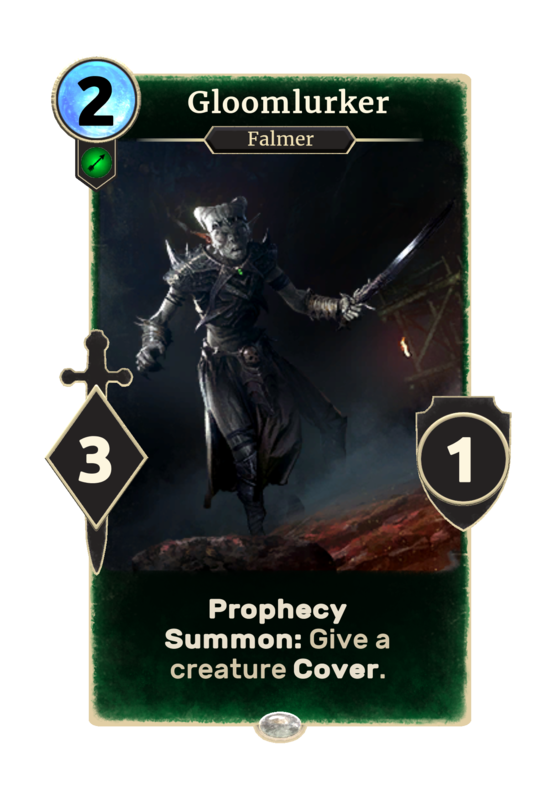 Fate Weaver – Very powerful in prophecy heavy decks, again like prophecy Battlemage, and can cause huge swings in the board when pulled off prophecy. 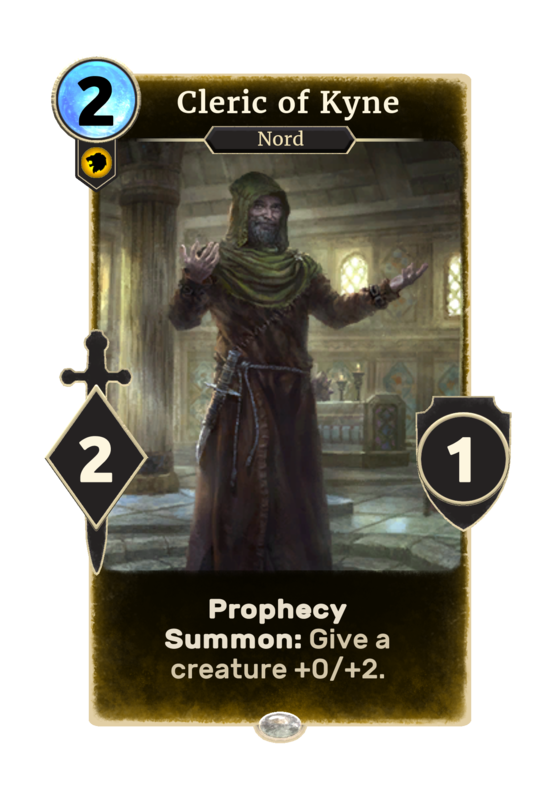 Cleric of Kyne – Most commonly played in midrange mage decks as they have few good two drops, and this can trade effectively with most other two drops. It’s summon effect can have an impact on trades. Cloudrest Illusionist – A very powerful card often played in tokens and other midrange decks with Willpower. Its effect enables very effective trades and can stop an attacker for 4 damage. 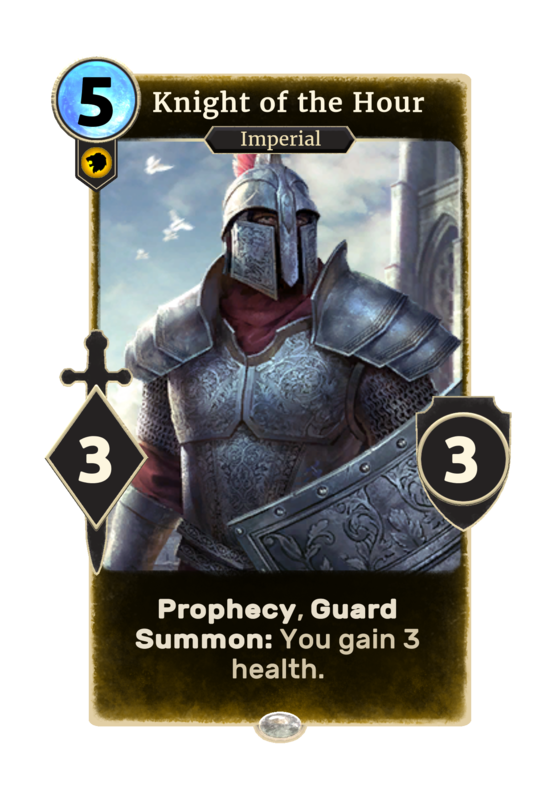 Knight of the Hour – Most common in slow control decks, though has lost much of its popularity recently. Can stop an aggressor in their tracks and gain a bit of life back, but played from hand is quite lackluster. 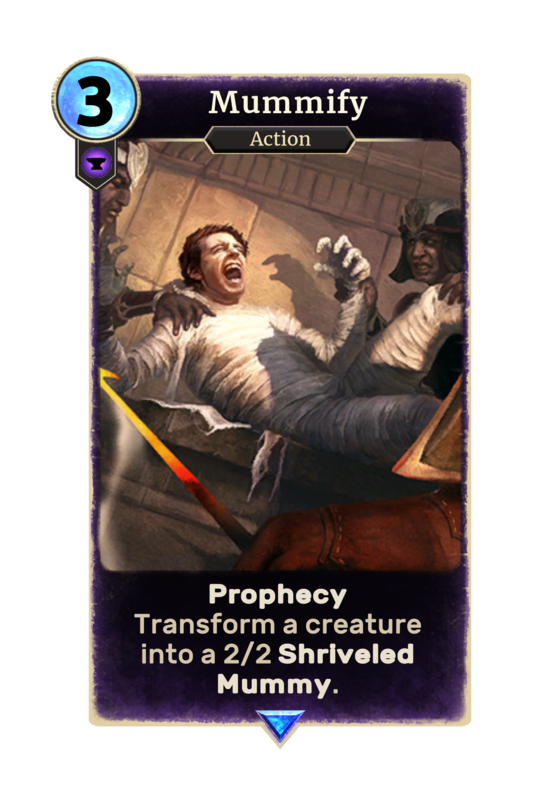 Piercing Javelin – Played in most willpower midrange decks and almost all willpower control decks, can stop an attack and will usually remove the best creature or biggest threat. Always be wary of this card from a willpower opponent. 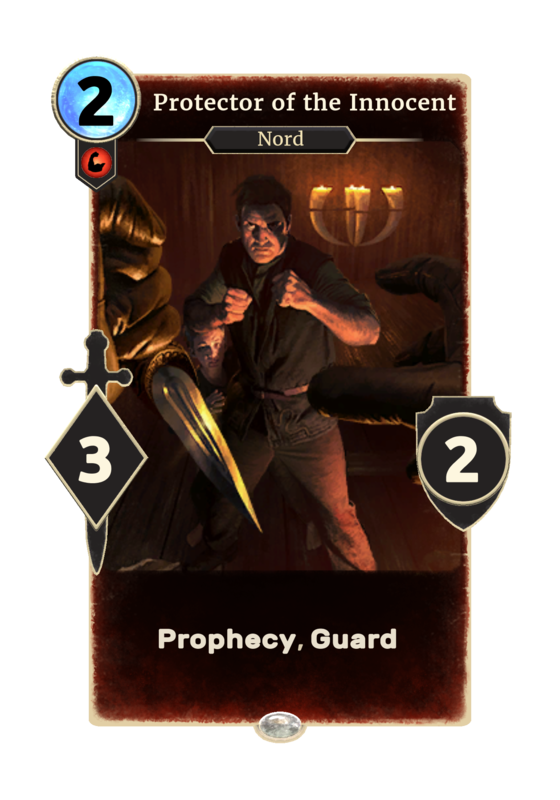 Daring Cutpurse – Occasionally found in agility midrange or aggressive decks, this card can snowball into a very large threat if left unanswered. 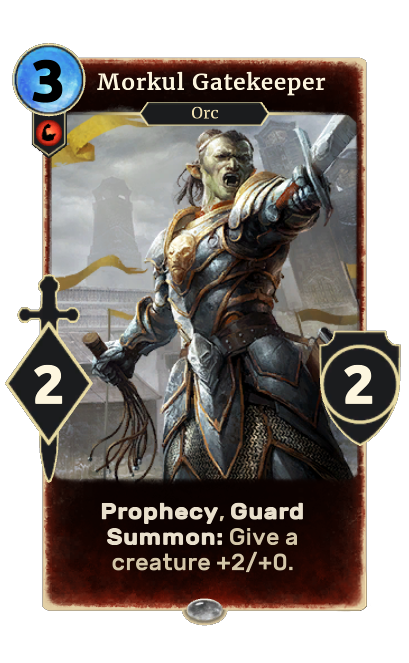 Fighters Guild Recruit – Found in most agility control and many agility midrange decks, this is a nightmare for most opponents hoping to attack or make even trades, forces trades or an answer and the trades will often favor the player with the recruit. Gloomlurker – Hides a creature for a turn, great card for tempo-focused lists like Tempo Assassin, but can be easily traded with if not protected. Blacksap Protector – Occasionally found in midrange agility decks, it can help protect your threats or slow an aggressor if prophesied, and is a decent play on curve from hand. 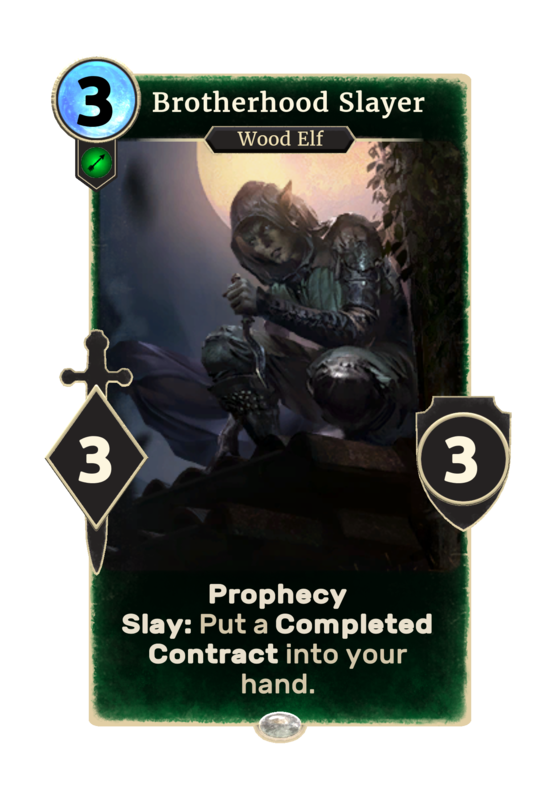 Brotherhood Slayer – This won’t mess with your plays when prophesied but is a solid play from hand as it has decent stats and a solid slay ability. Usually found in midrange agility lists. 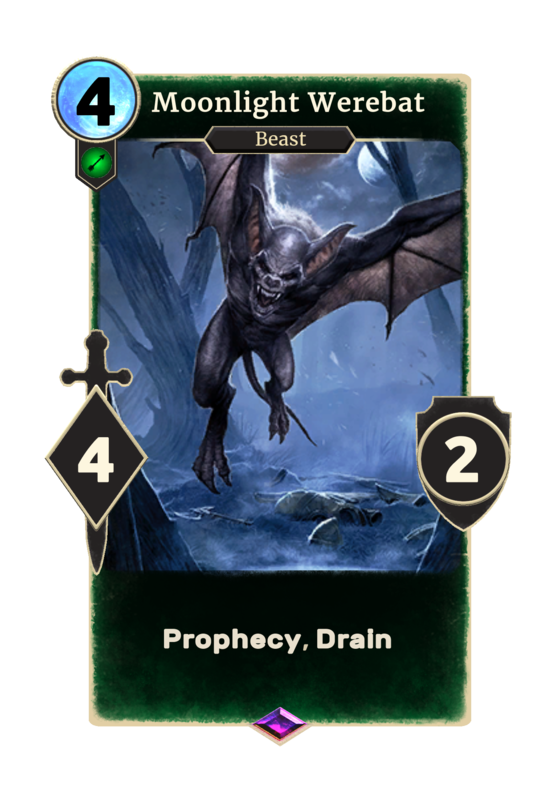 Moonlight Werebat – Found in some agility midrange or control lists, especially unstoppable rage decks, this card can help swing a match if prophesied early, but won’t have an immediate impact on attacks. Mummify – Found in Endurance control decks, can shrink a powerful or valuable creature. Can slow an attack if you are building an individual large threat, but is not too effective vs a board with many small creatures. 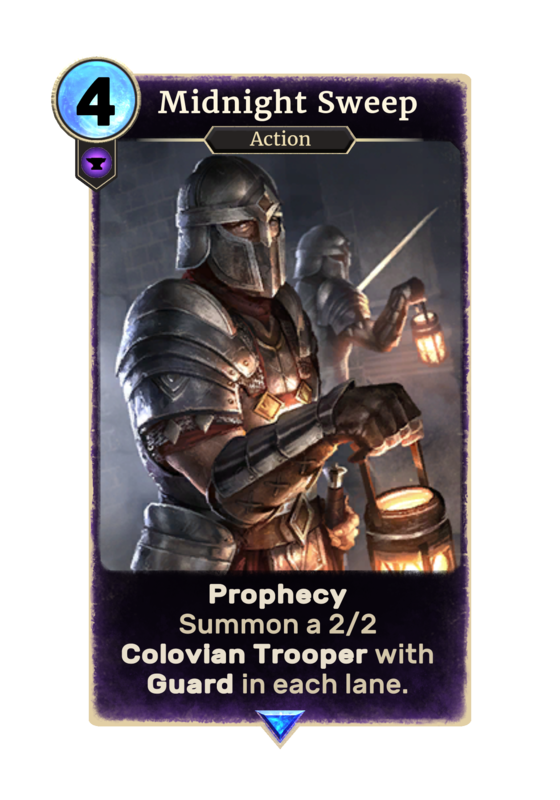 Midnight Sweep – Found in Endurance token decks, can slow an attack but is easily traded with. 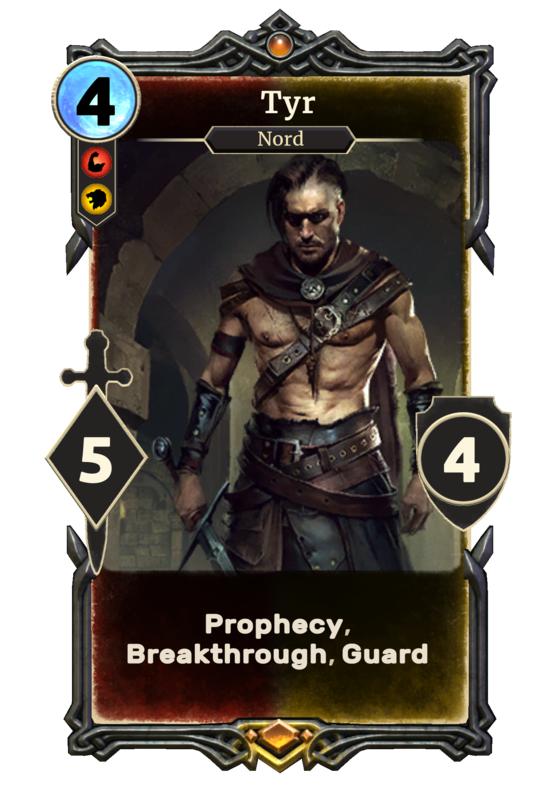 Tyr – The only Multi-attribute prophecy, is sometimes played in crusader midrange or control decks. It can slow an attack but is not very common. 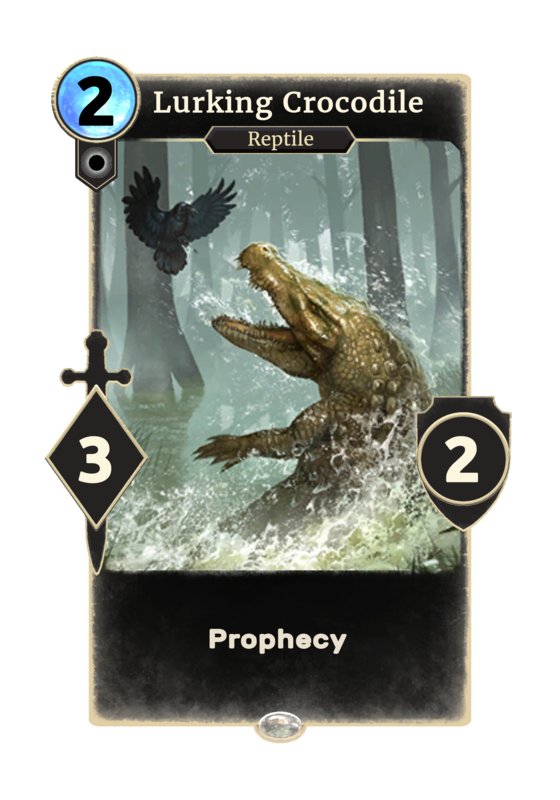 Lurking Crocodile – Most commonly played in prophecy heavy decks, this cannot stop an attack but can allow trades in their favor or build their board more. Dark Harvester – Generally only played in control decks, can really hurt an attack as it has got decent health and gains you 4 health. 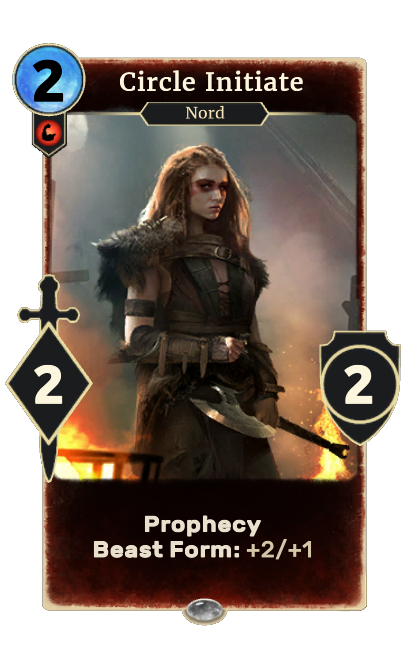 Not very common but keep in mind when facing very slow, prophecy filled decks. That’s all for today! I hope you learned some new ways to outplay your opponent, now go claim victory! **Shoutout to UESP for the amazing card images!